[#VSONLINE] New license model and prices for builds, load testing, release management, etc. A few days ago Brian Harry has released some Christmas news with some changes in the licensing model for Visual Studio Online, and also he make some clarification related to the prices of some of the services in VSO. The premise in these numbers is the time that takes each build (1st col), the number of builds that we launched a day (2nd column) and the days of work per month (3rd column). This is completely relative to each team, since if you have a continuous CI process, a team of 20 people and beams of checkins 30 half a day, then the numbers will be others. Returning to exercise builds and price, if we do a quick analysis of the price list, the first thing that strikes us is that, with exceptions, really you should spend 20 hours per month. For example, having a build that average takes 5 minutes, spent the same to launch 10 daily builds to build 50 daily. I won’t go into detail of scenarios more complex, where a build also compile and run tests, also generate packages, deployment packages, run tests automation, etc. I think this kind of compilations are not which run on a CI environment, though no shortage of exceptions and it will be necessary to adjust prices to the model requiring each team. Author elbrunoPosted on 14 Dec 2014 Categories EnglishPost, Visual Studio Online, VS Online BuildTags English Post, Visual Studio Online, VS Online BuildLeave a comment on [#VSONLINE] New license model and prices for builds, load testing, release management, etc. [#ALM] About Annual Performance Reviews, new Managers and feel free to break walls !!! When we are getting closer to end-of-year, we usually get to that fabulous moment where we face the annual performance review. I know, I am not going to talk about that topic for 2 reasons: first one, is that painful model gives me hives and that would also give to write a full post. Is much better to read what Ilya Pozin wrote about this in 2 pages (link). One of the points that stresses me, and also included in the post, is that the frequency of the feedback need not be annual it should in “real time mode”. He also point some spots like for example minimize the critical negative about the work, talks about statistics and differences between assessments towards women and men; and a couple of other things. What I think is missing is a bit of vision about the managers / beloved leaders / bosses or however is called your team. When a evaluations process begin to be more effective, it also changes the way in which someone leads a team. If we start from the basis: an evaluation is an act which aims to correct a mistake or reinforce good practice in a team, since much of the responsibility for this act lies with the person who carries it out, let’s got deeper into the manager role. For example, I’ve seen many cases where the managers, take a model 100% oriented to the delegation of tasks and its role is simply to direct and command a group of people. IMHO this is usually as spit against the wind. In modern equipment, the health of the team depends on the relationship that exists between members in the same. If the only thing that makes the boss is giving orders, when it comes to communicate an assessment, for sure the first thought of the evaluated one will be something similar to “and he tells me what? if he does not understand nothing of what we do“. On the other hand, the attitude of the beloved leader is lead by example, the time of the evaluation is much closer and probably far more effective. A little more about this. I do not mean that a manager has to work closely with each of the members of the team (which you should do if you can). Leading by example means to be consistent with actions that we perform because those are which will appear on the members of the team. In these cases, and as a matter of common sense, the beloved leaders tend to be chosen by the team. This brings me to the second point which is related to the frequency with which these assessments are performed. My recommendation is not invest 15 minutes a day with each Member of the team, but if you analyze the variables that define the team environment and such time take advantage of retrospective or similar to make these assessments. And here we come to an important point, if your company assessments are annual, That does not mean that you are not able to change this way of work. I do not mean to convince managers of human resources to change the way of working with 10000 employees, but rather to perform disruptive actions from the inside. Someones will think I intend to foment a revolution, and the truth is YES. If you really believe in a model that can work better, you must to apply it on your team. Discuss with other colleagues and in the long run if the model is good, for sure that you end up adapting to the philosophy of the company. Note: Provided that you propose a good idea, do not think that there is a top layer so obtuse as to not realize the advantages of a change for better. Convince your ‘bosses’ what you think. I know, it’s like spitting in the wind and most likely is goes wrong, but … and if it goes well? Author elbrunoPosted on 11 Dec 2014 12 Dec 2014 Categories ALM, EnglishPost, ManagersTags ALM, English Post, Managers1 Comment on [#ALM] About Annual Performance Reviews, new Managers and feel free to break walls !!! If your like me, you probably get to work on different computers. So, the chances that you also have to adapt to each of these environments to VS IDE are great. For example, the Surface Pro has a very cool super definition HD and is very good , but the size is kind of a problem, you don’t have he choice to have many panels open at the same time. On the other hand, in my case, I have my main laptop for development with a touch screen monitor 21″ which is great to use at home most of the time. Visual Studio 2015 brings a very good feature, which allows us to save and recall different layours of the IDE. 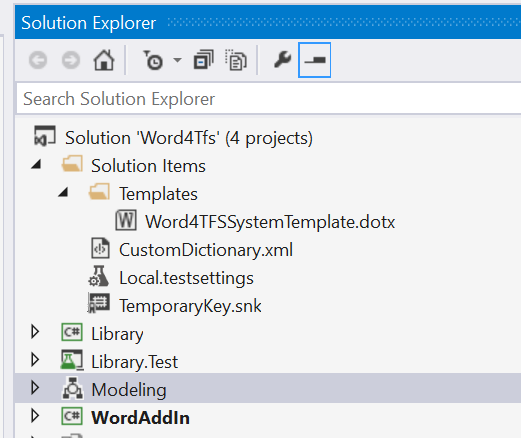 Using this feature, when I work with my single SurPro the editor code and Solution Explorer; I have active and in the other case therefore also active a couple of panels more. All this from the menu “Windows / Windows Layout“, as always a video that is worth a thousand pictures. For example, the typical action of “remove unnecessary usings” is now much more complete when we deploy it. As I said before, this kind of actions we know them of ReSharper.Y clear, as always in these cases ‘pressure’ passes to extension to see with that is surprising in the new version. 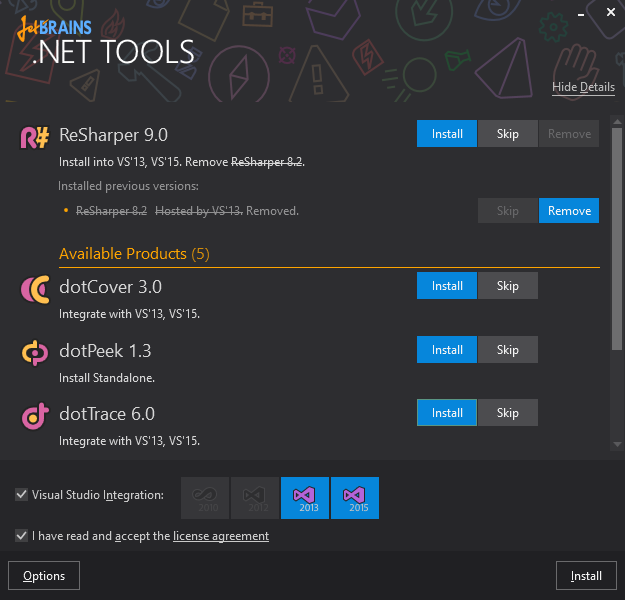 In this case in version 9, the first thing that will get us attention is that ReSharper is no longer an isolated product and becomes part of “JetBrains .net Tools“. What personally I seems great. 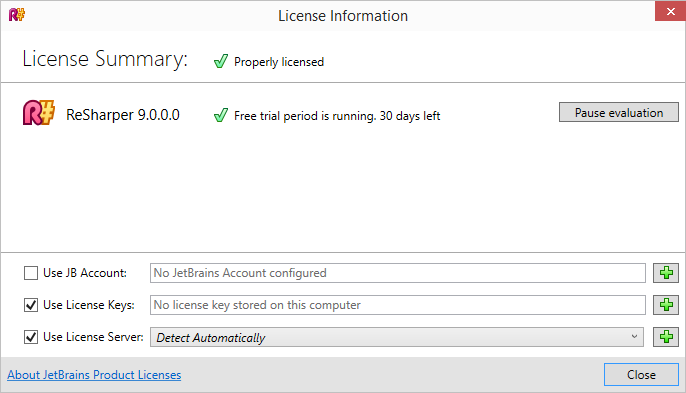 The JetBrains guys typically make very good products and have a same installer R #.dotTrace, dotCover and dotPeek, is already on a great idea. And then he comes to see the new ReSharper 9. The first thing we find is obvious: support for Visual Studio 2015.And of course, in addition to actions “basic” friends of JetBrains give an overview of C# 6.0 with new features and more than interesting scenarios (here there is a full post on the subject). Needless to say that I belong to 99% of the population to Hate regular expressions. Although they can be something very useful for basic tasks like validate an email, when we started using for replaces strange, since SkyNet begins. 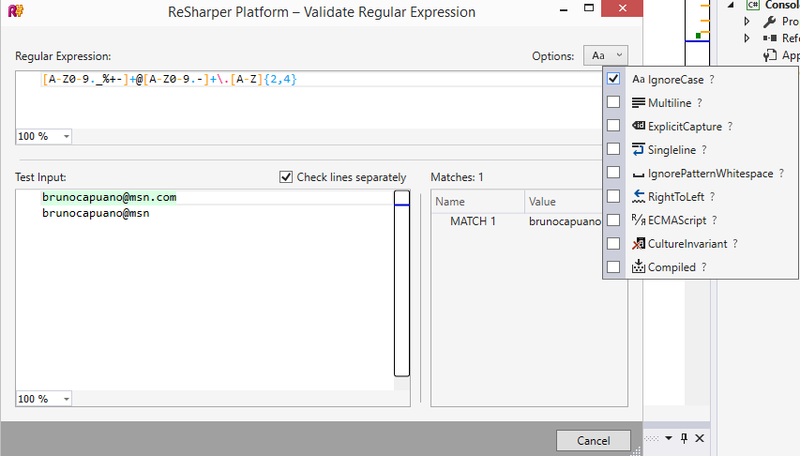 There are many tools to validate regular expressions (e.g. RegExBuddy), now well of R # has the touch of JetBrains and is very well integrated within the IDE. As before, I mentioned that the fix of usings supports such actions to level document, project, or solution. Now see as R # improve it a little more and give us these options for the “Fix in Scope”. Roslyn’s is amazing. There are projects like Code-Cracker allowing to have all the power of a code Analyzer at time of build (scenarios of CI are spectacular), others as NR6 Pack where we can see that in addition to being a good platform of refactoring actions, are thinking about migrating to MonoDevelop with what the concept “productivity” and “cross-platform” will be ever-expanding. The school of my children is amazing and I know that much of their work lies on my. So that’s why I try to help every time I can. That’s why, besides helping in football (Argentinian topic) and play the guitar for the kids, now I have the opportunity to share something closer to my dayly basis with the children. 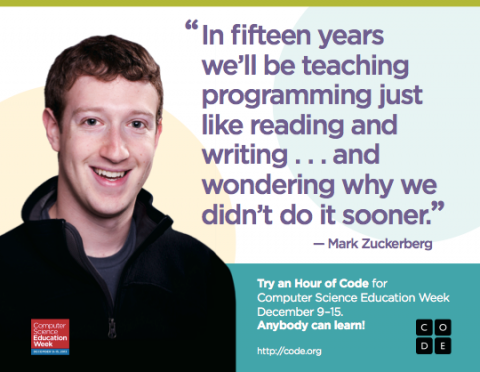 HOUR OF CODE, a global initiative to help children learn about the fabulous world of coding / programming. The truth is that behind this program you can find videos with some celebrities promoting the program such as Bill Gates, Barack Obama, Mark Zuckerberg… that’s great. The bases are also very simple: from different sources like http://code.org/, there many materials shared for everyone. The main idea in the week from 8 to 14 December, there will be some ambassadors to share an hour with the children and show them a little bit about the world of developers.